I feel like this has been talked about before. And why should that stop anyone from liking something? Have you recently accepted a position in the media or public relations offices of her administration? I never said that it did. I just know that, for better or worse, LBK is our resident iconography official. No, but I would if one was offered. No, LBK just claims to be our resident iconography official. I'm not aware, though, that anyone has ever verified her claims to expertise in this field, and she has thus far been reluctant to name anyone who can. I think that she is quite knowledgeable, much more than any other poster. She is as close to an expert that we have. However,experts are at times wrong, as she may be from time to time. If expertise consists in regurgitating simplistic opinions as dogma without any citation (apart from occasional references to canons found on the internet) then, yes, LBK is an expert. we could stop turning every icon posted and discussed into a discussion about a person. If that person wants to contribute, let them, but if not, just discuss without mentioning because some people can't keep from turning it into a discussion of the person and not icons. Actually, I can support her claim. I know for a fact that she knows of what she speaks. I will not disclose more, as she seems hesitant to reveal more information about herself, and it's not my place to disclose information she wishes to keep private. Well, that settles it then! 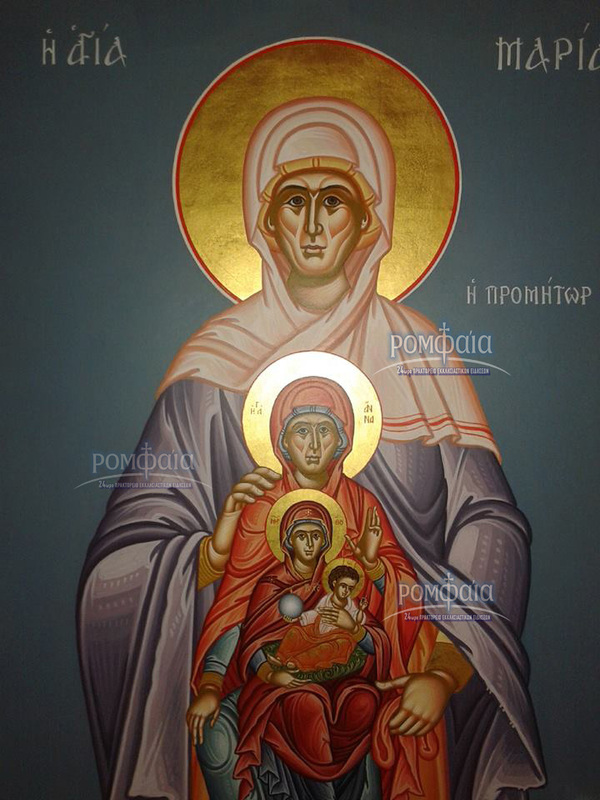 The first one is an icon of the Thetokos as a Protectress usually found in Russia. The wings refer to this scripture found in chapter 12 of Revelations. The wall behind her also has meaning. It comes the Canon to the Most Holy Mother of God. Save from harm your servants, O Mother of God, Virgin, for we all flee to you after God, as an unshakeable wall and defense. 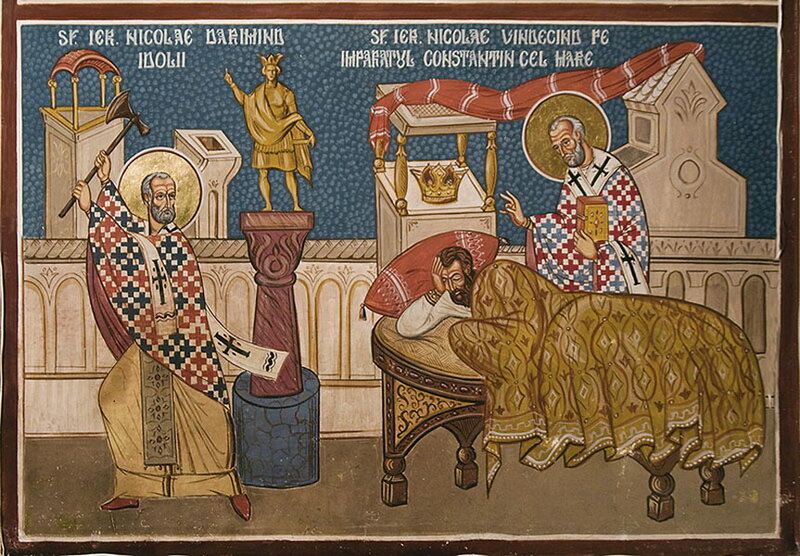 Why isn't St. Constantine depicted with a halo there? Is it because it was at some specific point of his life when he hadn't been baptised yet? I imagine he wasn't very saintly when he was about to condemn wrongfully accused men to death without trial. Still on people's size, the dwarves on most icons of the Theophany have always estranged me. Does anyone know the theological explanation? Personifications of the sea and the river Jordan. "The sea saw it and fled; Jordan was driven back. 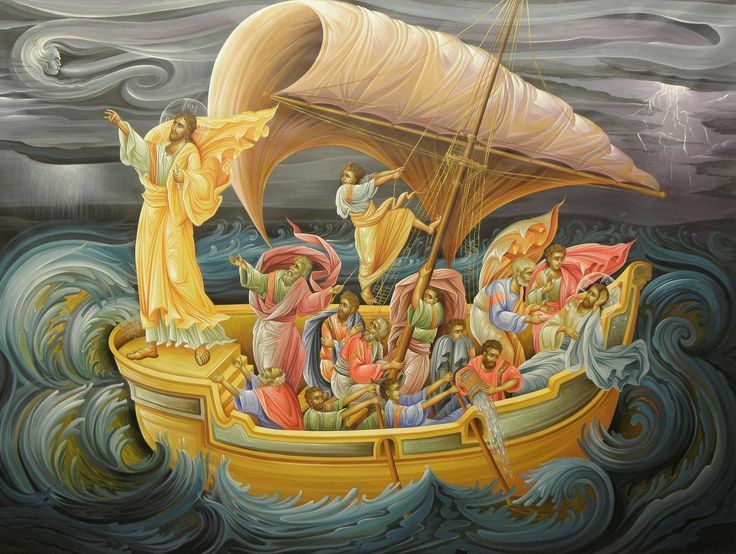 "What troubled you, Sea, that you fled; and you, Jordan, that you were turned back?" This icon looks wrong, not only for the doggy. However, I looked for it because my priest himself said St. Tobit was portrayed with his pet. I didn't find many icons of his anyway. Well, that's Tobias, not Tobit. And you're right. Br. Lentz's icon is the only one I have ever found for sale depicting Tobias. Although I find the stylistic dissonance between the saints themselves and the animals with them displeasing, I wouldn't go far as much to say it's bad on a theological level. Compared to some of the other work of Br. 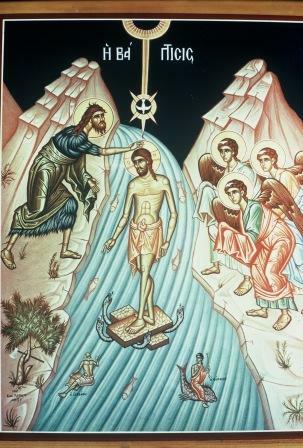 Lentz, this icon is very orthodox. But the icon basically says that the angel Raphael is the mother of Tobias, who is the mother of a fish and a dog, right? Not just -a- fish....that really looks like the almighty Salmon, possibly a Coho. A fact which our resident "expert" vigorously resisted here. This is not an icon. I'd argue that an mandorla would have to be present to suggest motherhood. On a more serious note, even though LBK know more about icons than most, she's just as fallible as the rest of us. P.S. I meant I enjoy your comments. Tell that to St Joseph! I bow to your superior taste. Actually, Year Menaions aren't all that uncommon. 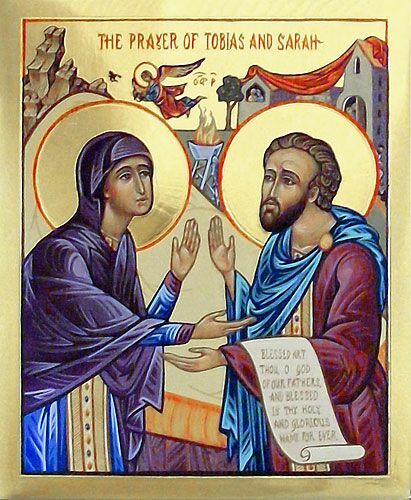 Ywah, year menanions aren't uncommon, as I wrote (maybe not directly, sorry for htis), but I haven't seen so many feasts and different icons of the Theotokos on one icon; I Wonder how much detaield work it demands.. But, indeed, the one icon you linked it's almost the same as I'd posted, so maybe it (I mean the type with many feasts, saints etc.) is not so uncommon. There are so many saints it'll take you a whole year to venerate them all! Just the fish. Dog is "G-O-D" backwards, so he is ever present, yet not touched by Tobias. St. Tobias's dog is much cuter, if you ask me. 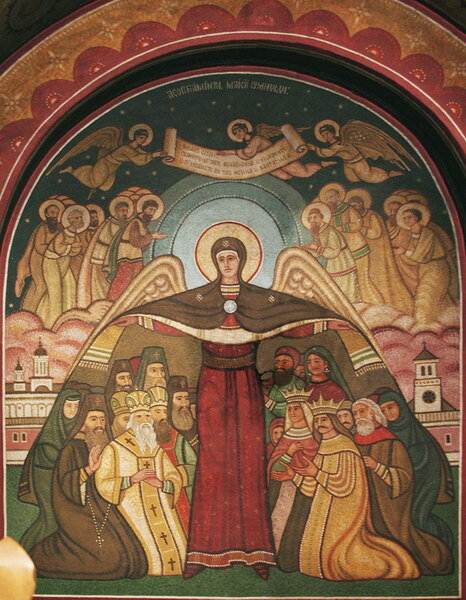 The common features of this image with the Robert Lentz Tobit painting is the clash of painting styles within their respective compositions: abstracted stylised saints and angels with the highly naturalistic renditions of the critters. The salmon is glistening, the dog is photographic, the hare looks warm, soft and cuddly. The dog in the Lentz work is also highly animated - one can almost hear him bark, and he sure looks like he's bouncing up and down as happy dogs so often do. 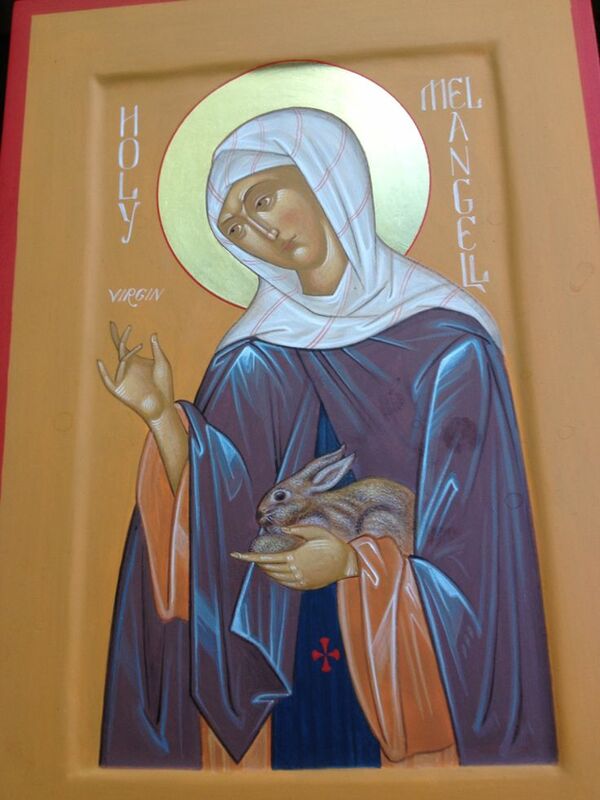 St Melangell herself is beautifully painted, but there's another problem: the fingers of her right hand are arranged uncomfortably close to that of the IC-XC clerical blessing. She was an abbess, not a priest or bishop. Kinda different, but I love it.